The aim of Scuba is to assist the explorer in fixing his spaceship by collecting enough materials from the environment around him. 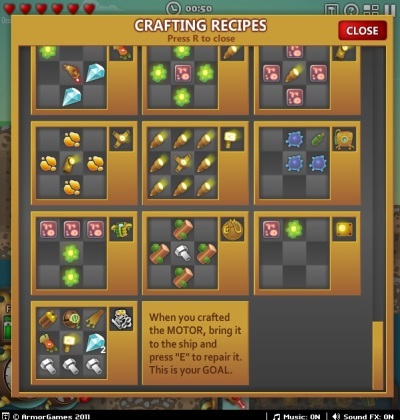 Almost materials such as dirt, soil, wood, coal, or rock are vital to craft necessary tools to fix the ship, and the recipes which show how ingredients combine together to create a certain tool specifically. However, things are not going to be so easy. Firstly, he has to work by the ship. Secondly, the explorer must face the pressure when he is in the sea. The deeper he goes the larger pressure he must deal with. Hence, to gather enough materials, he needs to upgrade his suit and other relevant equipment such as light, oxygen, laser, or boots. In short, in Scuba game, players are supporting an explorer to repair the motor of his spaceship by moving around and getting enough ingredients without doing harm to his life. Pressing H key will provide informative tips for players. Players make the character move with either WASD or Arrows. Choose items with left of the mouse. E is Use of Building. H is How to Play.